"With its new high density technology and sleek compact packaging, the Alert II represents an even more attractive form, fit, and function replacement for outdated crash alarm technologies" said Noel H. Schnell, Vice President, Forum Communications. Forum Communications International today announced the introduction of the Alert II Emergency Conference System. 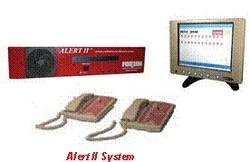 The Alert II is the next generation product in the award winning Alert series developed by Forum. The Alert II provides instant emergency conference communications for airport first responders and improves response times for Military and Commercial airports, and their aircraft rescue and fire fighting (ARFF) first response teams. The Alert II will be formally showcased at the National Guard Bureau Joint Information Technology Conference, December 7-9, 2009, in Orlando Florida. Known as Primary Crash Alarm Systems (PCAS), the Alert II was designed for and in collaboration with the US Military, and the system exceeds both FAA and DOD requirements for Airfield operations. The new design incorporates state of the art technology for instantaneous and distinctive ringing, clear conference communications, event logging, easy expansion up to 96 ports, and a touch screen user interface with visual indication of all first responder stations and their operational status. "With its new high density technology and sleek compact packaging, the Alert II represents an even more attractive form, fit, and function replacement for outdated crash alarm technologies" said Noel H. Schnell, Vice President, Forum Communications. "We believe our key customers in the Air Force and Air Guard as well as our commercial airport customers will be pleased with the improved performance and feature enhancements of the new Alert II platform". Forum Communications is a leading supplier of emergency response applications and conference and collaboration solutions to the DOD, commercial airports, and industrial campus environments. The Alert series of products have been widely deployed at Air Force, Air National Guard and Army airfields, Naval Air Stations, and commercial airports worldwide. Forum Communications has been at the forefront of audio conference and collaboration solutions with over 18 years of commitment to product quality and customer satisfaction. With over 100,000 ports in service for business, Federal, State and local governments, and DOD installations around the globe, Forum continues to demonstrate our proven commitment to customers with on-going enhancements, innovative feature sets, and award winning product solutions. Forum products are purpose built and designed using the latest in technology and user interface design practices. From conferencing to emergency response solutions, Forum continues to deliver. For more information call Forum Communications at 972-680-0700 or visit our website at http://www.forum-com.com.